Celebrity Silhoutte (left) and the Independence of the Seas at Port Zante on Wednesday. (CUOPM) – The parade of cruise ships to St. Kitts continued on Wednesday with four ships arriving with over 9,200 passengers. The visit of the Celebrity Silhouette, the Independence of the Seas, the Aida Luna and the Star Clipper brought the number of ships to 13 with over 25,000 passengers over the past five days. Arriving from Puerto Rico was the Celebrity Silhouette with 2,881 passengers, the Independence of the Seas arrived from St. Maarten with 3,969 passengers, the Aida Luna with 2,070 passengers and the Star Clipper with 303 passengers, a total of 9,223 passengers. On Tuesday 18th March, the four ships in port were the Celebrity Equinox with 2,852 passengers, the Adventure of the Seas with 3,403 passengers, the Seabourne Spirit with 197 passengers and the Silver Cloud. 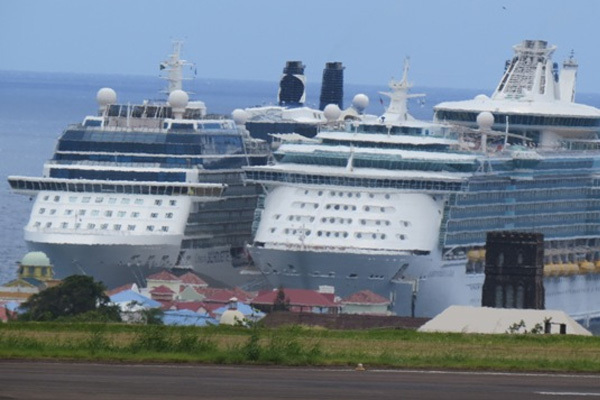 Monday 17th March, the port of Basseterre was graced with the Celebrity Summit with 2,211 passengers and Explorer of the Seas with 3,118 passengers, while on Sunday16th, the lone ship in port was the Albatross with 665 passengers. On Saturday, 15th March, the Emerald Princess docked at Port Zante with 3,080 passengers. Most of the over 25,000 passengers came ashore and went on sight-seeing tours in Basseterre and island wide via the St. Kitts Scenic Railway, buses or taxis. Scores headed for Brimstone Hill Fortress National Park, sea and sun bathing on the beaches, snorkeling, biking, sailing to Nevis, horseback riding, golfing, casino gambling and shopping, while others took time to surf the internet and make contact with friends and family. Seven more ships are scheduled to visit between Thursday and Saturday of this week. The 200-passenger Seabourne Pride, the 2,500-passenger Aida Bella, the 1,875-passenger Horizon and the 67-passenger Le Ponant are scheduled on Thursday 20th; the 3,700-passenger Carnival Valor and the 1,506-passenger Thomson Dream and the 3,006-pssenger Carnival Splendor o Saturday 22nd. Ten (10) more cruise ships are scheduled for next week and 11 for the rest of March.